The benchmark NIFTY50 confirmed its breakout after attempting to move past the 10490-10535 zones as it continued to inch higher and ended the day with net gains of 64.75 points or 0.61%. Given the present set up on the Charts, despite some brief consolidation, the Markets are steadily headed towards the 10650-10690 levels over coming days. Tuesday is likely to see a positive opening and the Markets may extend its gains, at least in the early part of the trade. 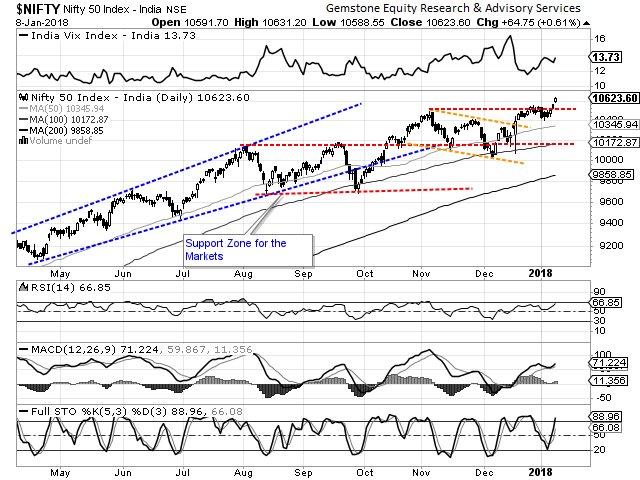 The levels of 10650 and 10695 will act as immediate area of resistance for the Markets. Supports come in at 10590 and 10565 zones. The Relative Strength Index – RSI on the Daily Chart is 66.8519 and it has marked a fresh 14-period high which is bullish. The Daily MACD stays bullish while trading above its signal line. On Candles, yet another Rising Window occurred. There are 8 Rising Windows in last 50 Candles and this makes the current Rising Window even more bullish. The pattern analysis confirms a breakout above the 10490-10535 resistance area. The momentum is likely to persist as the Markets have formed a continuation gap as it advanced higher with the breakout. Overall, we expect the buoyant intent of the Markets to persist for some more time. Though some consolidation at around 10690 levels cannot be ruled out, the overall upward momentum is likely to remain steadily bullish. We expect the Markets to test these levels and beyond while it is expected to resist to 24-month long trend line on the Weekly Charts. We reiterate completely avoiding shorts and continue making select purchases while vigilantly watching profits at higher levels. Positive outlook is advised for the day.